Sophie Janna and Margot Merah sing together like sisters. 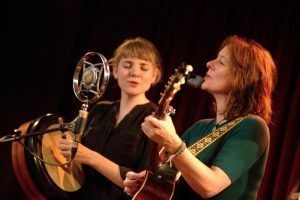 Songs from the Celtic and American traditions and beautiful original songs are brought with clear voices, heavenly harmonies and full hearts. The Lasses specialize in strong stories that speak to audiences now as much as when the songs were first written. With honest, effective arrangements on bodhrán and guitar, the beautiful blend of the women’s voices takes the centre stage.